I wish I was being facetious but this is a legitimate entry in the D&D 4E monster manual. Bears live in forests. Your character can only know that if you roll a 15 which represents moderate difficulty. That’s not to take a complete dump on 4th edition, in fact, this is probably one of the best monster manuals for actually using the knowledge skills properly in that at least you have clear guidelines about what you can tell the players based on what they rolled on their check. 5th edition, as well as other editions of the game, leaves it arbitrarily up to the GM what a knowledge check means with little to no real guidelines as to what the check means. If we use 5th edition modules as a guideline for how knowledge checks works they seem to involve the GM telling the players they have to make a knowledge check in the area and if one of the players manages to reach the DC value then the GM tells them the information blurb. This is incredibly passive and incredibly dull way of resolving knowledge. If the information was worth telling the players in the first place, enough that you’ve written space in your module to include it, why not just tell your players it without them rolling? What positive benefit could withholding it have? Many GM’s have a hard-on for denying information to players. This is not a useful approach when running the game as more information means more choices and more choices means more roleplay. The truth is most of the time your players really don’t know anything that is going on within your game as the majority of it is inside of your head and so there’s never really too much information you can ever give. You might have some super secret awesome plot reveal up your sleeve that you want to design the perfect, most magical moment to whaam in your players face and say gotcha! But the impact of this really isn’t going to be nearly as much as you expect for the reason that you are denying information to the players. If you deny information to your players because you want them to be surprised at a plot reveal chances are they won’t actually be surprised because you denied them so much information that the reveal itself causes more confusion or the feeling of ‘oh that’s another thing that happened’ rather than any particular revelation. Giving the players lots and lots of information, on the other hand, will make those revelation moments appear organically because the players will be able to piece together what is happening by themselves and importantly actually have enough information to make informed choices. Knowledge checks in this respect inherently go against the idea of just giving players information. You end up just using them because they are on people’s character sheets and they’ve invested points into them. Even if you’re playing in a game that’s designed in an incredibly linear fashion knowledge checks don’t serve a huge amount of purpose. Either the designer of the adventure needs the players to know x or y piece of information and so will give it to them, or the information will make little or no difference and so is either a waste of time to give, or can be given whether or not a knowledge check is successfully made as it won’t make much difference anyway. Beyond making the player who took the knowledge skill to feel like they didn’t waste their time. So how can we make knowledge actually work? Probably the most interesting way is to scrap knowledge skills entirely and rely instead on the players simply asking questions and the GM providing them answers or vice versa. This injects a good degree of freeform improv into the game and keeps you and your players engaged. If that scares you you can just resolve knowledge by telling the players the answer to their question or at worst how to find it such as looking in the great library. This might sound scary but will create a better game. If we are to insist on skill rolls then knowledge rolls should be about recalling something in a pinch, when time pressure is against you , for example in the midst of a combat. 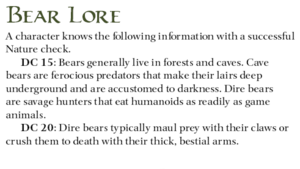 As with the aforementioned bears in the woods knowledge of monsters is a good way to give out effectively metagame information about creatures without. This can be both in respects to the creatures physical stats as well as their weaknesses. A player who has knowledge in an area and shows interest in finding out more should also probably be given something irrespective of what is rolled. Another method is to use knowledge as an excuse to lore dump on a player. In that, if their player has trained in knowledge of arcana, or history, or nobility you can provide them a handout with more in-depth information on that subject within your game. You could, of course, provide everyone with all the handouts but generally speaking, people can only hold so much information in at once so spreading it over the group and to characters who would know that information helps disperse it in an organic way. They can then share that information as they wish and when it comes up. If you create robust, well-structured scenarios then a character who is knowledgeable can use that knowledge as an avenue to resolve a situation within the scenario. If there is a curse infecting the town the wizard in your group may want to go and hit the books about any other curses that bear a resemblance to that. If nobody in the group has particular knowledge in that respect? Well, it doesn’t matter as its a robust scenario so there’s plenty of other avenues you can go to instead. Knowledge then is another arsenal in a groups toolkit rather than a means unto itself. Do let me know, how do you use knowledge in your games?